PRESIDENT Mugabe yesterday met Anglican Archbishop of Canterbury Justin Welby at State House in Harare. Archbishop Welby applauded relations between the Church and the State in Zimbabwe which he said were improving. “It was a pastoral meeting and not a political meeting but the meeting was confidential but we talked about the affairs of the Church. We talked about the future in Zimbabwe. 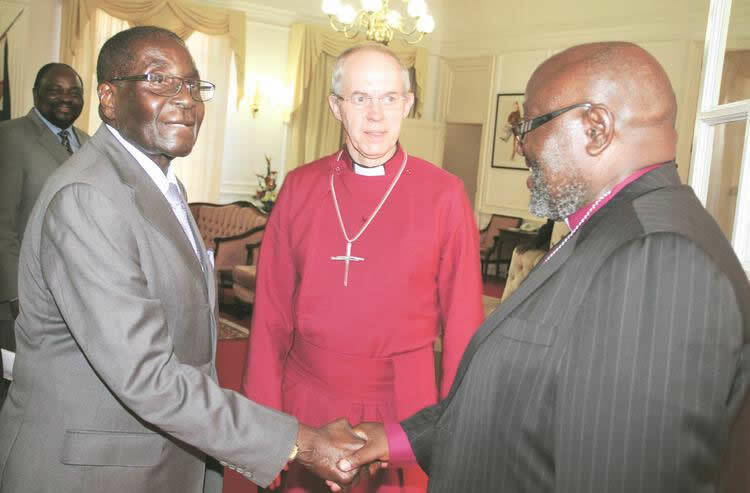 President Mugabe briefed Archbishop Welby about the children’s party held at the City Sports Centre. “They enjoyed themselves and all of them we took them from our different provinces,” said President Mugabe. Vice President Emmerson Mnangagwa and senior Government officials attended the meeting. On Saturday Archbishop Welby attacked a crop of young charismatic prophets preaching the “prosperity gospel”, saying they were ripping off congregants. In an interview with our sister paper, The Sunday Mail, on landing at the Harare International Airport, Archbishop Welby said the prosperity preachers were deceitful.